Understanding China ATVs Features and design! 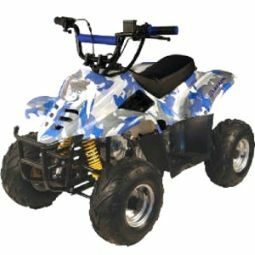 There are basically two styles of China ATVs.The China ATVs features may vary from each style. The sporty style, shown here in blue camo, and the utility or hunting style shown lower. 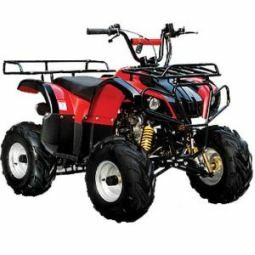 The differences are composed of the fender design and whether of not the ATV has storage racks on the front and rear. The sporty style has a sleek racing look to it, and the hunting style has the racks. So for our purposes, this will be the two names we will use; sporty and hunting styles. Safety first! 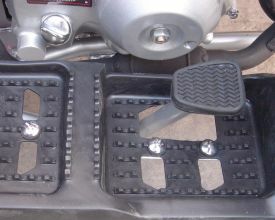 China ATVs feature numerous safety items. They all have speed governors that can limit the speed a child can go to a crawl. Speed governors like the one shown here are very easily adjusted. 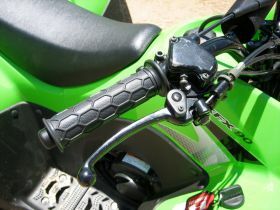 They are usually located on the right side of the handlebar near the brake lever. It is a screw and nut. You simply loosen the nut and tighten the screw to your desired position and tighten the nut again to hold it there. The further you tighten the screw, the more it will restrict the throttle. Just as if you would put a block under your cars accelerator. For innformation on Kids Quads click here! While the speed governor is a good fist line of defense for safety, many China ATVs feature other options as well. A safety lanyard is often found on the rear of the ATV. This is so you can walk behind small children and pull the lanyard to shut off the unit if need be. It can also be attached to the child to be used as a cut-off switch in case the child should fall off. 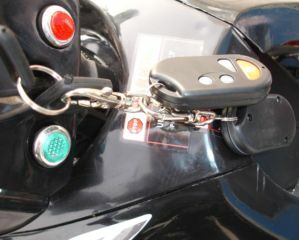 Many China ATVs also have a remote that can be used to shut the ATV off from a distance. When I ride along with my daughter, I hold her remote. If she appears to be getting carried away, I can shut her ATV off with the touch of a button. The remote sometimes also controls an alarm if equipped. China ATVs have other important features that you might not think of when you think of safety. For example, many youth models of the Japan brands do not have working headlights. Some actually have stickers where the headlight should be. Most all China ATVs feature front and rear lights. All I have seen also have front and rear brakes. A very nice feature for the smaller models is a foot controlled brake. My daughter first started to ride at 4 years old. Her little fingers were not long enough to reach the hand brake while holding the hand grip. Even if she could reach it, there is alot going on there. She would have to steer, throttle up/down, and brake with that hand. With a foot controlled brake, it is musch easier for little ones to learn to just step on it to stop. China ATVs Features are among the best in the industry. Most every model now come with all the bells and whistles. Of course, rider education is always the best way to avoid an accident. However, proper maintenance and good safety features sure help!